A lot has happened since our latest blog post, which I think was written from Guatemala. Rachel flew out of Guatemala City to New York City and I (Josh here!) rode quickly through several countries. We reunited in San Jose Costa Rica after a week apart and we’re already in Panama! We never plan too far in advance, so we didn’t really know where we would be when it was time for Rachel to be in New York. As it turned out it lined up with what were considered Central America’s “more dangerous” countries of El Salvador, Honduras, and Nicaragua. I had the idea to spend the week riding through them alone in part to “protect” Rachel from the danger and partly to have something to do besides twiddling my thumbs. El Salvador was first, and one that some people had warned me was crazy to enter. I considered adding five hours to the trip to go around through Honduras, but other people had warned me about Honduras so it seemed like a wash. I was very pleasantly surprised by El Salvador. I stuck mainly to the coast and was greeted by tropical beaches and very friendly locals. When I told some of them that in the US people warned me El Salvador was dangerous, they laughed. 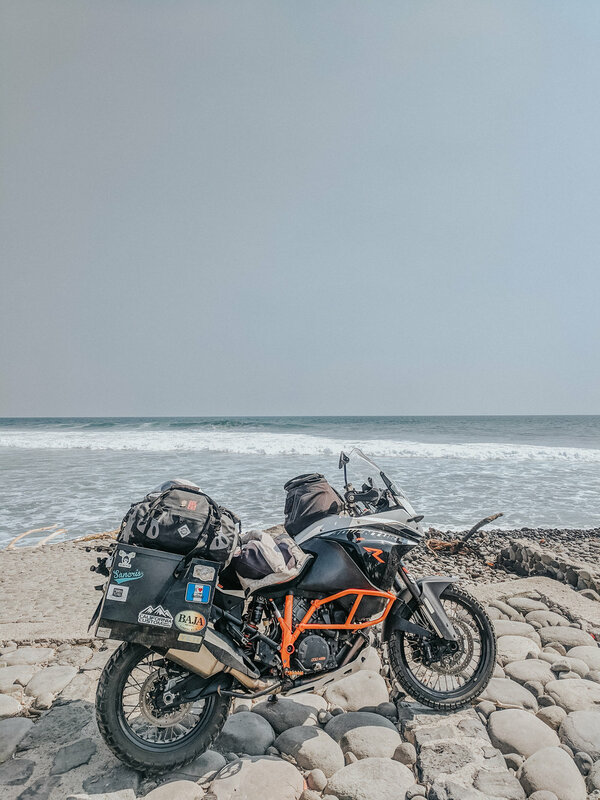 After El Salvador I planned to ride through the Honduras and Nicaragua border in one day. Google Maps showed this to be a five and a half hour ride, not counting any border crossings. I’d read sometimes these borders could take up to eight hours. There is a part of me that wants to suffer and this was the perfect opportunity to do it without making Rachel suffer too. Oh, and it was going to be 105 degrees. The borders went relatively smoothly, although expensively. I paid for helpers and some of them got the better of me, but I think in the end it was worth it. These borders were the most confusing I’ve crossed. The helpers are there not just to help translate, but also because there are about twenty different windows and people that need copies of passports and motorcycle titles and copies of stamps in passports and receipts and copies of receipts… Yes, they could be navigated alone but only if one is looking for the eight hour crossing I’d read about. The section of Honduras I rode through was dry and unremarkable. I only saw one town, and it was hot and dusty and a place I don’t expect to revisit. I rode into Nicaragua and took a much needed rest day in Leon, another hot and dusty city. I would later tell Rachel she skipped the right part of the ride- mainly referring to this day. It would have taken us at least two days and neither would have been the most fun. So while I never faced any danger, I did “protect” her from that portion of the trip! I travelled down to Grenada, which was a picturesque colonial town. We’d been watching Nicaragua closely since last summer when the government had faced protesters and responded with violence and live bullets. In the end, at least 300 people were killed by the government and many more imprisoned. Thousands more fled the country. A lot of this happened around Managua, the capital. The weekend before I entered Nicaragua, after months of quiet, there were fresh protests this time demanding the release of the people arrested the first time whom were still in captivity. I meant to avoid Managua, but due to a missed turn I found myself riding right through it. After reading all about the governmental murders, I was shocked at what I saw in the city. First a large modern office building for rent, looking like it had just been completed. Next, a Walmart, then down the road a Hooters! This looked like any suburb in America. This wasn’t a war-zone, but it had just been made one temporarily. And recently. It was jarring to think of a government killing it’s citizens in a place that looked so much like home. I rode through with no problems. I saw no protesters, just people going about their lives as usual. In Grenada, I met a man named David who said he’d learned English just by talking to travelers who’d visited from the US and Canada. I told him I was impressed and he said “Well I’m an old man now”. When I asked how old I was surprised to hear him say “59”. Either he lost count of a few years or life in Nicaragua is even harder on the body than I imagined. I rode towards Costa Rica alongside the massive Lake Nicaragua. It was windy enough to make waves and it looked just like an ocean coastline except for the two massive volcanos jutting up from the center of the lake. 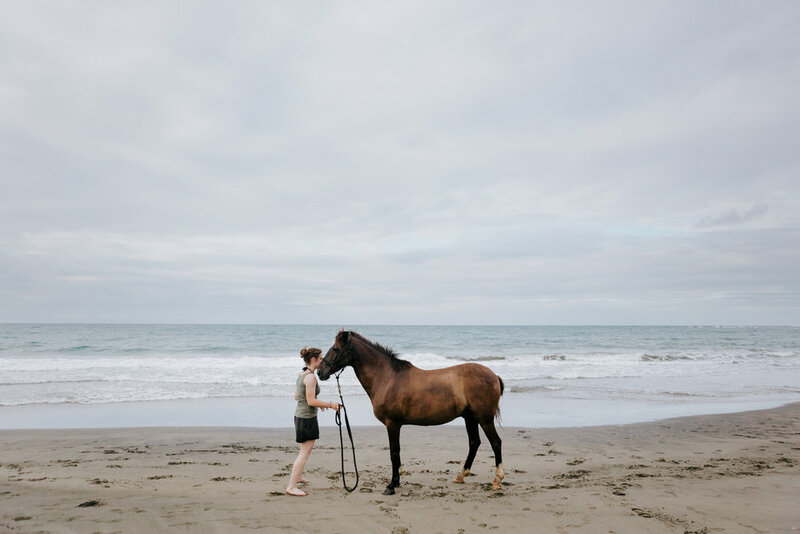 I felt like I could spend more time in Nicaragua; there was something endearing about the people. And as a recovering cheapskate, the prices matched what I had been expecting to find along this trip. With bananas being sold for 3 cents, maybe it wasn’t just the people that made me want to stay longer. I stopped one night in Liberia, Costa Rica. Nothing eventful happened there until I went to leave in the morning. I needed gas and cash and there was a station less than a mile from my hostel that offered both and was right on the highway to San Jose. Somewhere between the gas pump and the ATM I dropped my cell phone. I spent an hour looking for it, and even went upstairs with the boss to review security footage, but we couldn’t tell where I’d dropped it or who might have it. The phone wasn’t a huge deal, but the frustration of not understanding how it had happened was worse. That and I knew it was also my only tool of navigation and I was on my way into San Jose, a city of 339,581 people. I stopped several times to ask directions to our hostel, sat in traffic for two hours, and after a much longer day than I’d planned I found our hostel. Northern Costa Rica was at the end of its dry season, and things were much browner than I expected. It was still hovering around 100 degrees as it had been since entering El Salvador. Rachel arrived from the airport that night and we were happy to be back together! We decided to head to the beach and couldn’t decide between the Western side and the Caribbean side. Eventually we decided Caribbean since they don’t have a dry season, and we were rewarded with a lush green ride out to the coast. When we arrived we realized we were only 45 minutes from the border with Panama, and we had planned to spend a couple weeks in Costa Rica. We felt like we had “skipped” Costa Rica, even though I’d ridden diagonally across the whole thing. We entered Panama and it was as green or greener than Costa Rica. The people were very friendly, and we happily rode to Almirante and parked the bike and covered it. We took what we’d need for four days and jumped on a water taxi out to the town of Bocas del Toro. It was dark when we got in a taxi for a forty minute ride to the North side of the island. When we woke up in the morning we found our bed and breakfast was perched right on the beautiful turquoise water looking out at Bird Island. We’ve been trying to get grounded and ditch the feeling of rushing through destinations. We had been looking forward to Costa Rica, and ended up not experiencing our expectations. 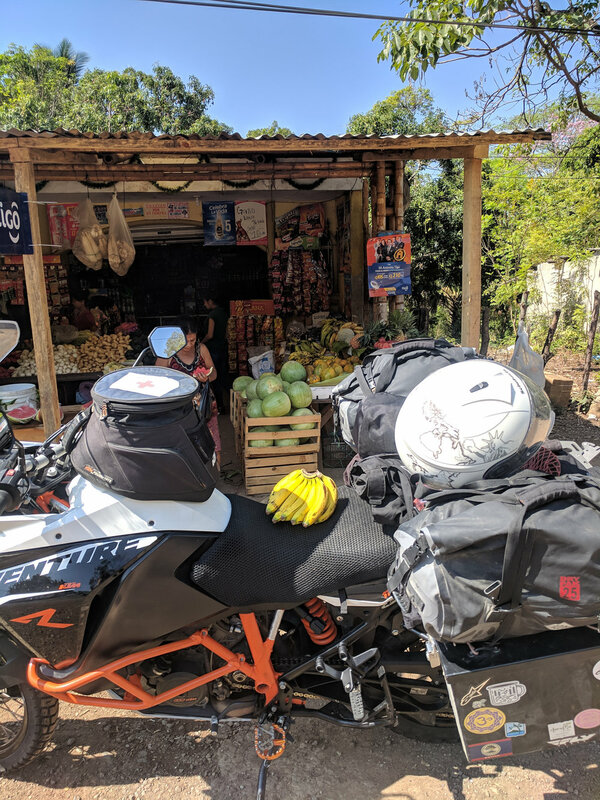 Conversely, we planned to rush through Panama because we didn’t think there was anything to see here and our expectations have been blown out of the water. That’s been fairly consistent so far: our enjoyment of a country seems to be inversely proportional to our expectations of it. Maybe something for us to think about and integrate into our “real lives” too!